My May Inkling for my Ranger Yahoo Group. 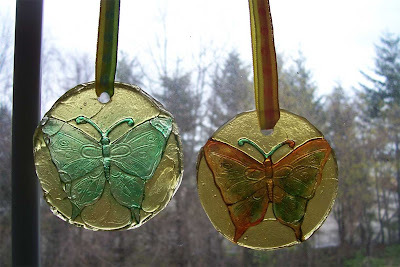 I found these magnets in the $1 bins at Michaels and the idea came to me to use them as molds to make sun catchers now that the sun has decided to come out here in MA. Melt four scoops of UTEE in the melting pot following the directions that came with the melting pot. Once completely melted add 1 scoop of UTEE Flex. Let Flex melt completely. Grease decorative magnet with a little oil or spray with PAM. Place on Non-stick mat and pour the melted UTEE over the magnet and let cool completely. Carefully remove the magnet from the cooled UTEE and trim off any excess (you can reheat these pieces and use again). To get the image to stand out more, color with Archival Reinkers or Alcohol I nks using cut and dry foam. 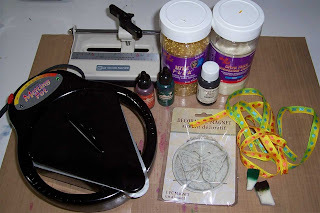 Punch a whole in the top of your Sun Catcher add decorative ribbon or fibers and hang in a window and enjoy. Previous Post I’ve Been Tagged!! !